I was lucky enough to attend Google’s Apps Script Hackathon at their office in DC, recently, and got a chance to play with Apps Script. After a quick walk-through tutorial, Jan gave us a couple of hours to hack around with it. 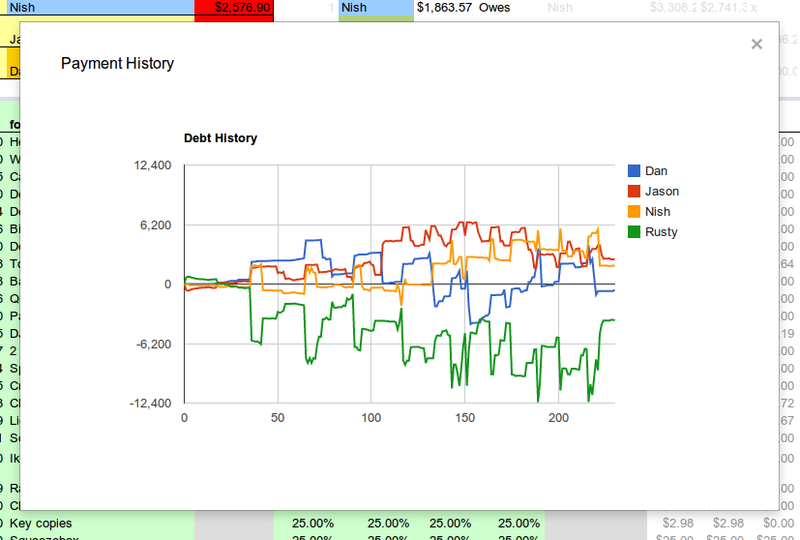 My roommates and I keep a spreadsheet on Google Docs to track who owes what, but since we’re a house full of software engineers, it’s gotten pretty complicated. Each row records the details of a single transaction: who paid, the total, and what percentages of the payment are on behalf of which roommates. All these interpersonal debts are added up into the (J5:M8) matrix, cancelled out across the diagonal into (P5:S8) to get a single debt for each roommate pairing, and then those are totalled into the final "Shake Out", (F4:F7), which says whether you owe or are owed. Maybe Apps Script could make my life simpler here? // Send emails to everybody with their current status. // This guy owes money in the shake-out. This just pulls the current totals from the (G4:G7) "Shake Out", as well as their respective email addresses from (O3:R3). When this function is called, if any of them owe more than $0, they get a friendly reminder! I could set that up to trigger daily or weekly, but it only really needs to happen when somebody needs to collect what they’re owed, so I’ve added it as an option to the sheet’s menu on start-up. Easy! Now when somebody wants to collect, they just click the “SkyCastle -> Email debtors” option and the appropriate reminder emails are sent out, from their own Gmail address. // Process the current line here, and compute the shake-out. I’ve omitted the actual calculation, because it’s just a bunch of hacks specific to our spreadsheet formulas. Each row contains the row number, and the accumulated shake-out thus far, and gets added to the `data` table. I break out of the loop once I go off the end of my data and start hitting `NaNs`. After adding this function as another option in our custom `SkyCastle` menu and clicking it, we see a nice graph. (I’m almost always on the bottom, but that’s because I make the actual rent and utility payments.) The final entries are equal to the original "Shake Out" cells, so our old arithmetic seems correct, too. Apps Script seems to work well, overall, and hooks into a nice and expanding array of Google products and data sources. The GWT-backed UI service is a clever idea, though I barely had a chance to touch it. Thanks again to Jan and Google for hosting this Hackathon; I can’t wait for the next one! 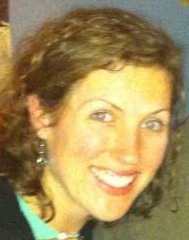 Rusty Mellinger co-founded Illogic Inc, making heavy use of Google Apps and GWT. requests allow you to perform partial updates on many of our REST APIs and in most cases can save bandwidth. There is a workaround to this. Most of our APIs support the X-HTTP-Method-Override header. This header can be used in a POST request to “fake” other HTTP methods. Simply set the value of the X-HTTP-Method-Override header to the HTTP method you would like to actually perform. This trick can also be used if your application server is behind a firewall, behind a proxy server or in any other environment where HTTP methods other than POST might not be allowed. In that case you could use the X-HTTP-Method-Override header the same way to workaround these limitations. You may also use our Google APIs Client library for Java or our Google APIs Client library for Python, both of which have support for PATCH requests and use the X-HTTP-Method-Override header when appropriate. PATCH requests allow you to perform partial updates on many of our REST APIs and in most cases can save bandwidth. As part of Google's Real Estate and Workplace Services (REWS) Green Team, the Healthy Materials program is charged with ensuring Google has the healthiest workplaces possible. We collect and review information for thousands of building materials to make sure that our offices are free of formaldehyde, heavy metals, PBDEs and other toxins that threaten human health and reduce our productivity. My team, as you might imagine, has a great deal of data to collect and manage. We recently implemented Salesforce.com to manage that data, as it can record attributes of an object in a dynamic way, is good at tracking correspondence activity and allows for robust reports on the data, among many other functions. And this is where Google Apps Script came to our rescue. We found that we could use Google Apps Script to create a new Case or Lead in Salesforce.com when a form is submitted through our Google Docs form. This allowed us to continue using our existing form and get our data directly and automatically into Salesforce.com. Google Docs + Apps Script + Salesforce.com = Integrated Goodness! Salesforce.com has two built-in options for capturing data online - Cases and Leads. Google Docs Forms can capture data for both of them. Set up your Case or Lead object with the desired fields in Salesforce.com. The next step is to generate the HTML for a form. You will use the IDs in the Salesforce.com-generated HTML when writing your Google Apps script. 2. Make sure Web-to-Lead/Web-to-Case is enabled. Click on Edit (Leads) or Modify (Cases) and enable if it is not. Create your form and spreadsheet (or open up the one you already have and want to keep using). This is very easy to do. Go to your Docs and click on 'Create' to open a new form. Use the form editor to add the desired fields to your form- they'll show up as column headings in the corresponding spreadsheet. When someone fills out your form, their answers will show up in the right columns under those headings. The script is set up to take the data in specified cells from the form/spreadsheet and send it into designated fields in your Salesforce.com instance (identified by the org id in the HTML generated above). 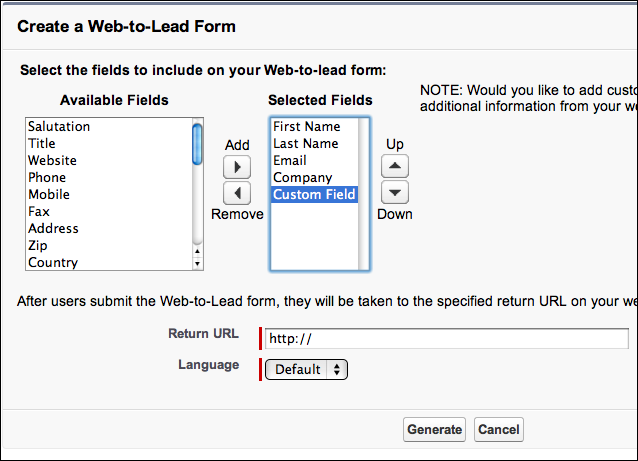 For example, the form submitter's email is recorded through the form in one cell, and sent into the email field in either the Lead or Case object in Salesforce.com. 1. Create a new script (Tools > Script Manager > New). 2. Write the script below using the pertinent information from your Salesforce.com-generated code (shown further down). Define your variables by directing the script to the correct cell (row, column number). 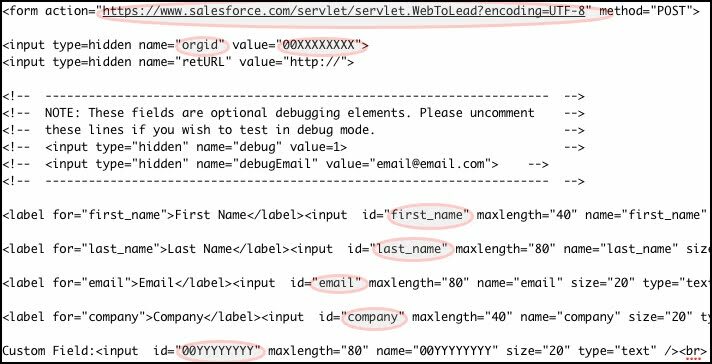 Then in the payload section, match the field id from your Salesforce.com HTML (red) to the variable you defined (blue). For example, the email address of the submitter is defined as variable 'email', can be found in the 4th column of the last row submitted, and the id for that field in Salesforce.com is 'email'. Note that any custom fields you've created will have an alpha-numeric id. 3. Save your script and do a test run. D) Wiring Script to a Form Submission. To send your data automatically into Salesforce.com, you need to set a trigger that will run the script every time a form is submitted. To do this, go to your script and click Resources>Current script's triggers. 1. Create a Trigger for your function so that it runs when a form is submitted. 2. Post the link to your form on your website, send it in an email, link to it on G+, etc. Get it out there! That's it! Now when someone submits a form, the information will come into your spreadsheet, and then immediately be sent into Salesforce.com. You can adjust your Salesforce.com settings to create tasks when the information comes in, send out an auto-response to the person filling out the form and set up rules for who is assigned as owner to the record. You'll also have the information backed up in your spreadsheet. This has been a great solution for our team, and we hope others find it useful as well! Beth Sturgeon is a member of Google's Green Team in Mountain View, which makes sure that Google's offices are the healthiest, most sustainable workplaces around. Prior to Google, she had a past life as a wildlife researcher. Note that we draw the screen only once the buffer is fully colored, to avoid the overhead of coloring cells individually. 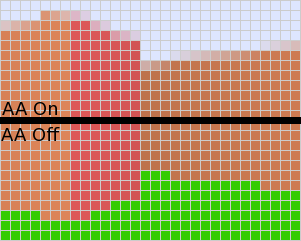 The trick is in the drawing: the upper and lower halves of the screen are symmetrical in shape, and the only computed value is the display height of the wall. The screen really is just a fancy formatting for an integer array of columns. We store these 3 values at the bottom of the sheet, to ensure persistence (else, each refresh would bring us back to the start location!). It is also possible to modify the map in real-time: write a character in the boxes you want to swap, then hit Refresh map. The height of the drawn column is nothing fancy: the further the wall, the smaller-looking the wall, hence the smaller the height of the column. Again, nothing really complicated. However, the simplicity of this wall-height technique is the reason behind its major caveat: there is no clean way to look up or down: you can only turn left or right, and move forward or backward. As you probably noticed, the low display density makes the sharp, jagged, edges really visible. 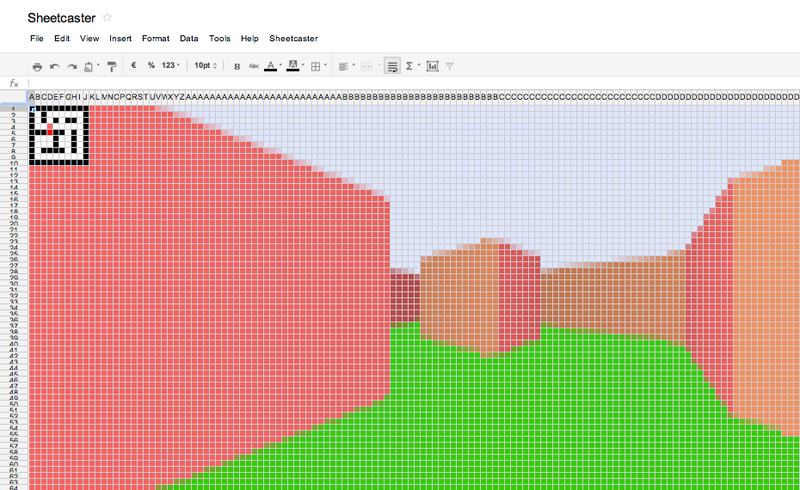 Fear not, reader, for we also implemented anti-aliasing! When the runs are really small (< 5 columns), we attenuate the gradient intensity, as it would only add another pixel above (below) the column, thus rendering the antialiasing utterly useless. Real-time was not an objective, the main problem being controlling the player/camera. Scripted movements should however be quite easy to implement with a fixed duration loop, restarting itself using an Apps Script recurrent time-driven trigger (a minute-long loop, repeated every minute). This is left as an exercise to the reader. Please feel free to copy the script and walk around this Apps Script virtual world. Thomas is interested in low level computing and application security. Amaury is passionate about algorithmic problem-solving and software engineering. Ahmed is interested in kernels, compilers and theoretical computer science.